This week Disney released a new trailer for the TRON Uprising animated series to be released on Disney XD next month. As Blue Sky Disney said in his post HERE the trailer looks terrific, and you can check this by yourself below. The good thing is that these animated series indicates that Disney is willing to go on with the TRON license. Sure, a good animated series can help to prepare the audience to a third TRON movie, specially considering that TRON Legacy box office in 2010 was good although less than what Disney had expected ( $400M worldwide including $175M in the U.S for a $170M production budget ) and reviews of TRON Legacy were so-so with 50% of "rotten tomatoes" on the Tomatometer. So, Disney could have decided to stop anything TRON but as we can see they didn't did it. And not only that, but chances are that we'll see a TRON 3 movie in a near future. Sure, if the animated series are popular this will help to launch the TRON 3 production, but there might be another reason for that, and this reason is: Shanghaî Disneyland. Take a look at the rendering above - not perfectly sharp, i agree, but that's the best we can get so far. It's an excerpt of the new bird's eye view artwork that was presented at the National Committee of U.S - China relations last fall. On the left of the castle you have SDL Tomorrowland. As we know SDL Tomorrowland won't have Space Mountain. Instead WDI will introduce a TRON motor bike coaster as revealed by Screamscape some months ago. And if you look well at the big white building on the very left you'll see that its design looks like a stylized motorbike - what a surprise. Now, what you must not forget is that chinese audiences are familiar with recent Disney productions but not really with the old classics - that's one of the reason why Hong Kong Disneyland doesn't have the classic DL dark rides like Snow White, Pinnochio or even Peter Pan's Flight. Instead HKDL have the Winnie the Pooh ride as ten years ago Winnie was the most known Disney character in China. Of course chinese know Pixar animated or Pirates of Caribbean movies and TRON Legacy, when released in China in 2010 even did $18M, a remarkable number as it was the third highest of all foreign countries. 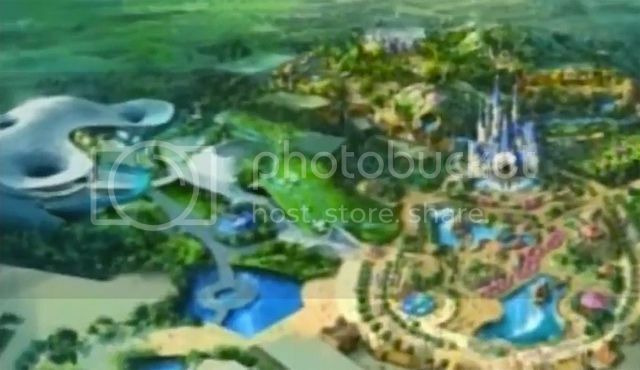 Back to SDL: One thing we can be sure of is that Bob Iger wants that Shanghaî Disneyland will be a success from day one, and also that he had a special look on the attractions developed for the park, if not the "final cut". Now that the not-yet-officially-confirmed choice to build a TRON motorbike coaster has been done, Iger probably wants to make sure, too, that the TRON license is not forgotten in China. For us who know the world of TRON since 1982 and consider the original film as a cult movie, it's simple. 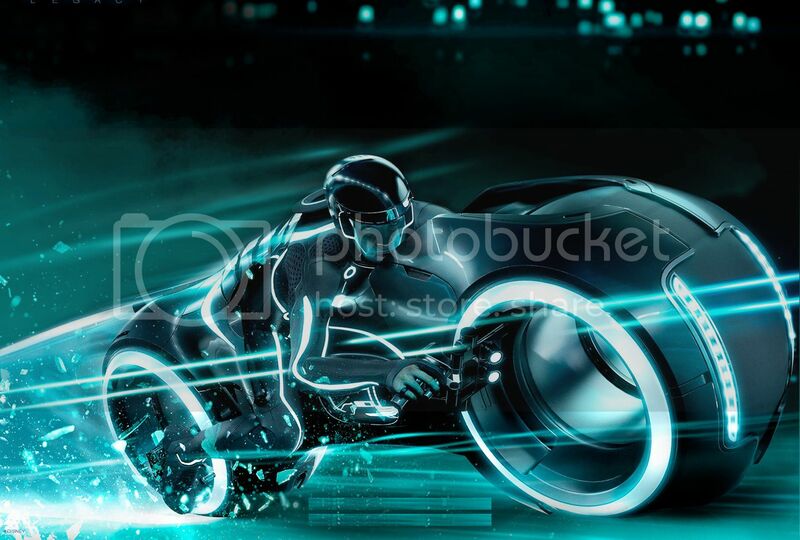 A TRON ride, if well done, will be a dream come true for most of us and who wouldn't like to jump on a TRON motorbike and race in the amazing world of TRON? But for chinese who didn't discovered TRON 30 years ago but only in 2010, it's different. And, as the success of the Shanghaî Disneyland ride will also depends how much the TRON mythology will be known and popular in China, that's one of the reason why - in my opinion - these animated series will be followed by a third TRON movie anytime soon. Thanks for the news. I got a long lasting wish: that Rock'n Roller Coaster with Aerosmith in WDS (Paris) gets rethemed into Tron. This could be a great update to this ride and to my taste so much more immersive than the original ride. This could seriously reboost WDS attendances and give this part of the park (Backlot) a welcome refreshment. This could be done thanks to great neon like lighting with leds, lasers and stuff, based after the Tron environment... anyway. I'm not a Tron fan, I liked the second movie, not loved. The visuals were great, but the plot was not good. However, I think that this Tron Coaster can be a great attraction if done properly, as the visuals of the movie can be used to make an awesome attraction, besides; the light cycles are the coolest things by far in the movie. The animated series look awesome and the good news for me is that Disney Television is coming back! Disney used to have the best TV programs in the 1950's and 60's, but recently only had terrible TV programs on the Disney channel. Now Disney XD is making very good series again, like the Avengers and now Tron, hope that they keep going on that direction! Oh come on, Aerosmith is so much cooler than Tron. 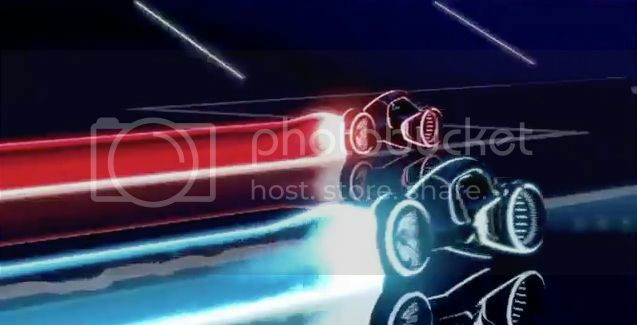 That said, the Test Track attraction get´s a shameless Tron makeover, whatever they try to tell you this thing is Tron. And with the fact that the original Test Track that was horribly themed anything is beter then how it was, even Tron. Even Ellens Energie crysis would be better with a Tron makeover, thats how bad it is. Tron is infinite times cooler than Areosmith. Both Tron films are two of the best films EVER MADE.